What does the Avalon Organics Vitamin C Renewal Serum do? The Avalon Organics Vitamin C Serum targets hyper-pigmentation, sagging skin, fine lines and wrinkles and UV-induced stress. This means that it fights the signs of aging caused by free radical damage, plumps up and firms your skin and gives you a fresher, healthier and more youthful complexion. 20% Vitamin C Facial Serum. Free from parabens, sulfates and fragrances. Who should use the Avalon Organics Vitamin C Serum? A vitamin C face serum is full of powerful antioxidants that help to reverse the damage cause by sun exposure and air pollutants. So anyone who has sun spots or sin discolorations will benefit from using this vitamin c facial serum. Also, if you have noticed the appearance of fine lines and wrinkles or a loss of collagen, this powerful antioxidant serum will help to tighten your skin and minimize those aging lines. How do you use the Avalon Organics Vitamin C Serum? 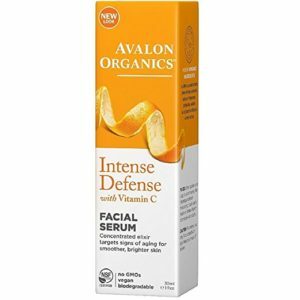 You can use the Avalon Organics Vitamin C Vitality facial serum morning and night. Just cleanse your face and neck areas as normal and pat dry. Then apply a few drops of the serum to your skin and once it has absorbed, apply a moisturizer and makeup if desired. If you have very dry skin, its best to use a moisturizer after any serum. This luscious antioxidant serum is suitable for vegetarians and is certified organic. It is fragrance free, phthalate free, and contains no sulfates or parabens. Vitamin C is a strong antioxidant that is essential in cellular repair and wound healing. It is also extremely beneficial in fighting the signs of aging cause by sun exposure and free radical damage. Vitamin C also stimulates the production of collagen, so your skin looks more plumped up and fine lines and wrinkles are reduced. Sun spots and age spots, as well as skin discolorations are minimized and your complexion looks more even toned and healthier. Using vitamin C for face blemishes or discolorations is an easy way to even up your skin tone and freshen your complexion. Sunflower oil has lots of vitamin E and fatty acids, such as Omega 6. So sunflower oil helps to hydrate your skin, reduces redness and helps to heal the effects of acne and dermatitis on your skin. This oil also helps in cellular renewal and helps to fight the signs of aging caused by free radical damage and sun exposure. Orange peel is full of vitamin c and calcium, so your skin looks brighter and more refreshed, your skin tone is much more even and your skin simply looks healthier. Blackheads and acne are minimized, pore size is reduced, dark circles and dry skin are reversed and sun spots and age spots minimized. Lemon oil has antiseptic and astringent properties so it helps to heal acne and blackheads. The oil also has great for people with a very oily skin as it helps to balance your skin and it makes your skin feel softer and improves dry or flaky skin. PROS: More than 70% of all customer reviews gave this hydrating serum a 4 or 5 star rating. Customers seem to love this serum, unsightly scars are reduced, it has a lovely orange fragrance and their skin feels softer, fresher and rejuvenated. CONS: Not many online customer reviews gave this vitamin C facial serum a one star rating. Generally, the reason for a low rating was because they didn’t see a noticeable improvement in their skin. I order this product regularly. I love how it makes my face feel, and has helped lighten sun spots. It’s been just a week since I’ve been using this product. My skin does look and feel a bit better already. Does the Avalon Vitamin C Serum work? With lots of antioxidants, this serum works well to brighten your skin and reduce the signs of aging. Your skin is more hydrated and your complexion is softer and healthier. The lovely orange smell is a bonus and it is very cheap as well. Anyone with an uneven skin tone, sun spots or age spots, fine lines and very dry skin should benefit from using the Avalon Vitamin C Serum. For more of my Vitamin C Serum Reviews, click here.